Providing knowledge tools to customers is a way of adding value to one’s brand. With that in mind, Messe Brazil developed to the exhibitors of Intermach 2019 – International Metalmechanic Industry Technology, Machine, Equipment, Automation and Service Trade Show and Congress – a technical content dissemination tool by means of workshops. 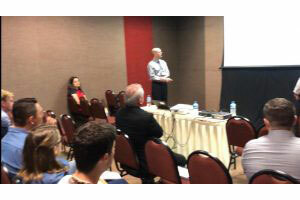 Richard Spirandelli, Messe Brazil´s director, reminds that Intermach is Southern Brazil metalmechanic market leading trade show, enabling access to new market technologies and perspective. “In 2019’s issue, it will be possible to have a vision of the future for the market next two years in terms of industry technologies and challenges. For that matter, the event will enable the visitor to undergo several experiences and opportunities, that go beyond the ordinary visit, and include contact with relevant content to his/her professional career”, he points out. There will be more than 40 hours of free workshops that will approach the technologies introduced in the trade show and enable experience exchange among professionals that face the same troubles and need the same solutions in their manufacturing processes. Messe Brazil provides rooms and audio and video structure, and the exhibitor that joins the initiative sets the theme to be presented and invites his/her relationship network to attend. The exhibitor can book the participation by contacting Intermach’s team through telephone 47 3451-3000 or e-mail feiras@messebrasil.com.br.